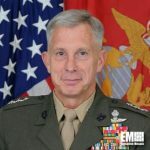 U.S. Marine Corps Lt. Gen. Thomas Waldhauser, joint force development director on the Joint Staff, has testified during a Senate Armed Services Committee hearing for a possible promotion as head of U.S. Africa Command, DoD News reported Tuesday. Jim Garamone writes Waldhauser, who was nominated to serve as Africom commander in April, will also receive his fourth star and succeed Army Gen. David Rodriguez if confirmed to lead the combatant command. The report noted Africom’s tasks involve helping build the capacity of allied nations to handle security as well as guard U.S. interests in the African continent. “Terrorist organizations and terrorist activities conducted by such groups as the Islamic State in Libya [and] al-Shabab in Somalia are present and active across the continent,” Waldhauser said at the confirmation hearing. Africom continues to work with African partners to develop environments that support partners in addressing security concerns, the report said.